of my Indian savings and have a week in Guernsey as I had promised Harold. There was also the added attraction of meeting his sister with whom I had been corresponding for so long. Harold still had a few months to serve. I arrived in Guernsey late in November after a disastrous passage on the SS Vera (it did everything but sink) and was met by Violet on the quay at 6.30 am feeling half dead with sea sickness. However a good sleep put me right and it wasn't long before I fell in love with Guernsey and Violet. After tasting the rush and turmoil of London, Guernsey seemed a demi-paradise and I still think so after 52 years. I had intended spending a week in Guernsey, but stayed nearly a month, arriving back in Bow just before Christmas 1924. In the meantime Vi moved from Guernsey to London so that we could be together. She first found a job looking after the children of some wealthy persons and also trying to teach them French (among other things). This didn't suit as our weekly half day off did not coincide - hers was Saturday afternoon and mine was Thursday afternoon. This wasn't to our liking and Vi eventually found another job at her own trade - that of cutter and fitter at a firm which supplied John Lewis of Oxford Street with their model clothing for ladies. London - go somewhere where it was warm otherwise I would end up as a TB case. I suggested Guernsey and he said it was the finest place in the world. It seemed at this time our family was being torn apart - **Winnie had left home to become a social worker and then to train at Dulwich Hospital. Sid had signed on for four years in the RAF and I was pushing off to Guernsey. It must have been a terrible blow to my mother, but that is how I arrived in Guernsey. It is interesting to remember that at that time I bought the last ticket in a raffle someone was running and I came up the winner of £3.00 (which was a lot of money at that time). The return fare to Guernsey was £2.19.0, so after paying my fare and 6d for the raffle ticket, I was still 6d in pocket. It seemed a good enough omen for the future. Vi returned to Guernsey about a week after me. Work was pretty scarce in Guernsey too, so I tool anything that came along. My first job was painting the outside of a house and I remember going up a very long ladder set against the gable and it seemed ages before I could take a hand off the ladder and reach for a paintbrush - I was scared stiff. The job was over in about a fortnight and I took another helping to build a greenhouse - surprisingly that greenhouse still stands - I wonder why! My next was a back room job at a pub. The owner used to bottle imported beer and spirits and I learned how to use the bottling machine and how to breakdown spirits to their saleable percentage. I earned 26/- a week with a promise of 28/- as soon as I learned to drive the van. I took free lessons from a friend in an E Type Ford and drew 28/- the second week. The driving test then was being told by a policeman to " drive up to that lamppost, turn and come back to me" You then slipped him half a crown and he issued your driving license. There were very few accidents in those days, maybe because there was so few other cars to bash into, or perhaps because of the 'severity' of the test. In 1928 I was still working at the pub, when we head that the St Peter Port hospital was looking for a deputy master and matron for the workhouse part of the hospital. Violet and I applied and we got the job, but it was for a married couple ! We got a special license and were married and in the job within ten days. We had about four days honeymoon. The workhouse side was tough - all the scum of the island were there, but we held the job for ten years. It was in 1938 that Mr and Mrs Hughes opened the hotel Beaulieu and on the opening night, which was a grand affair, that Violet and I realized they could not possibly run it alone. So we gave notice at the hospital and joined them at the hotel. The Beaulieu was made a limited company and I was appointed secretary and Violet, Housekeeper and general factotum. War broke out in 1939 and the Germans arrived in the island in 1940 - they took over the hotel as soon as they arrived, allowing us to stay. Soldiers were billeted in the hotel and we had to feed them until their own staff arrived. We ran the hotel as a pub, soldiers in the lounge and locals in the public bar. It worked quite well for about ten months and we swindled the Germans as much as we could - we sold them Green Peppermint Cordial at Creme de Menthe prices and they didn't know the difference. The cordial cost us 2/- a bottle and at Creme de Menthe prices in total we got back about 35/-. Eventually the Germans wanted the whole of the hotel and we got our marching orders. I was not sorry, our thieving activities on their stores was becoming a bit hazardous and I could foresee the day when we would be caught red handed. So we moved out Violet and I and our barman and his wife to the Salerie Inn, my other brother in laws place, and Mr and Mrs Hughes to the Farmers Hotel which they still owned. My brother in law Gordon had left for England when war broke out and joined the Royal Engineers and his wife and young son were evacuated to England. Harold Hughes and wife had already gone and he had joined the RAF and she worked in the British Restaurants. When we were settled we opened the Salerie Inn again and when we didn't want German soldiers as customers we put a notice in the window " Rien de Tout" (out of everything), but we let the locals in the side door. We went back to the green peppermint cordial lark and made quite handsome profit out of the troops until, like food and everything else we needed, the peppermint cordial ran out. After that we sold near beer made locally out of parsnips or rough cider imported from France. The German troops didn't like the Cider, they liked getting drunk slowly and one pint of cider would put them on their backs - but I must give them credit by saying when they got drunk we had no trouble with them. We simply carried them out and stopped the first German lorry that came along and put them on board. brought the bugs with us. Our first meal in the camp ( we took our own cutlery and mugs etc) was a thin watery something with cubes of Swede floating in it - it soon got the name of pineapple soup. If we were lucky we also got a potato boiled in its skin, dirt and all. Meals were twice a day 11.00 am and 4.00 PM and the menu never altered. If we had eaten all our bread from the day before, that was our bad luck. Bread was issued at 12 noon - 8 people to 2 kilo loaf of rye bread. Apparently the Poles had tried to grow some of their own food (I don't know where the seeds came from) and I remember when Vi and I were foraging round the small allotments, we found beetroot about the size of small orange - we were in luck and after scrubbing all the dirt off we ate it raw. We'd have eaten the paint of the doors had there been any. It was a long time waiting for 4.00pm. Real tea was unknown at this time, even to the German people, and we were issued with an 'ersatz' tea made from various herbs and the leaves from certain trees. It was wet and warm and that's about all you could say about it. There was a coffee made from roasted acorns, but we never had a taste of it. ( in Guernsey we made coffee from roasted parsnips and that was far better). At last the camp settled down and we were all given our various job by own camp captain, Mr Garland. Sweeping the roads in the camp, drawing rations (for what they were worth) - policing within the camp and opening up a school for the children, there were about 200 of them. Vi volunteered to teach them sewing. One man, a Mr Manning, brought a sewing machine all the way from Guernsey. Why, goodness only knows, but it proved to be a very valuable asset and he was quite willing to lend it to the school. We received a lot of outer clothing from the Red Cross and it wasn't long before they were cut up by Vi and others to make jackets and trousers for every child in the camp who needed them. Dorsten was situated in a crowded industrial district and every night the towns around were being bombed. Our camp was situated in a dip of ground alongside the Dortmund Emms Canal and we could look up to see the barges going by. It slowly dawned on us that if the canal had received a direct hit our camp would be under about 40 feet of water. We learned afterwards that the neutral Powers - Sweden, America and those not yet in the war, and of course the British Government, strongly objected about the situation of the camp and after about six weeks we were moved down to Biberach in southern Germany. This was a purpose built German barracks mainly built of bricks and mortar and much better than what we had left - but there were still our old acquaintances, the bugs. No matter how much we scrubbed we never got rid of them. We arrived late in the afternoon and were issued with our usual pineapple soup and men and their wives were allowed to remain together in each others barracks until 9.00pm, when whistles were blown as a signal for men to return to their barracks and women to theirs. I said goodnight to Vi and she set off for her barrack. The next morning we heard that one of the women had fallen into an eight foot air raid trench and broken her ankle. I think we all said ' What a lousy start in a new camp'. About ten in the morning a German Officer came in the room I was in looking for a man named Morris. He spoke very little English and I had no German at all but I managed to convince him my name was Norris - there were no Morris's in the camp. It was then he told me a women named Violet had broken her ankle. After about an hours delay for roll calls and counting (routine could not be broken and the Germans were lousy counters anyway), I was taken to see Vi. Fortunately at that time there was a British naval doctor, a Lieut. Sutherland captured in Crete, in the camp, and he set Vi's ankle and insisted that the next day it must be x-rayed. Vi was taken down to Biberach Hospital and the x-ray was 'good'. Vi remained in hospital in the camp for about two months. The hospital in camp was simply another barrack staffed by anyone in the camp who had any hospital experience and two Guernseymen who were in the St John Ambulance who volunteered to come with us. Vi walked about on a caliper for some time but she was not discharged from hospital because she proved too useful. It was really a blessing in disguise because we were snowed up waist deep and I was pleased Vi dodged it all. condensed milk, either evaporated or like Nestle, and quite a large tin of ambrosia dried milk - there was also a tin of dried egg. It was not possible to restrain gorging oneself from this bounty of food and more than half the camp was down with tummy trouble following a gorge. Our stomachs had shrunk so much they were not ready for this abuse - however we had learned our lesson and were more careful in the future. The German issue of ersatz tea was now used to scrub our tables clean and the sauer kraut they had started to dish out just blocked up the toilets until the issue was discontinued. The Germans allowed us to mark tins of meat veg with our names and numbers and were then taken to the cookhouse to be hotted up. While we were at Dorsten and for a few weeks at Biberach our guards were military, but Germany was running short of young fit men and they were replaced by much older men, somewhat like our own Home Guard. These were much easier to deal with and were not adverse to accepting a bar of chocolate for half a dozen eggs or something else we might need. like. One variety show opened with a scene depicting Britannia complete with shield and trident and a huge Union Jack and backed up with patriotic songs. The jerry’s cam down on that like a ton of bricks and it was a bit dodgy for a time whether we would be allowed to carry on. However we were allowed to carry on provided we kept well away from international politics. The camp theatre was a great success and again I praise the Red Cross for what they did for us. equivalent to an English Village except the one thing we all wanted - our freedom - and this came suddenly, one late evening - but more of that later. coloured the same as the outside of the cabinet. At an ordinary glance it was not noticeable. To cut a long story short, by removing the plugging he could get his now straightened screwdriver straight in the screw in the white porcelain. I asked him if he could get BBC and making sure the outside speaker was disconnected, he gave his screwdriver a few twists and there was the BBC. He then removed the screwdriver and plugged the hole again. For obvious reasons we could only listen to the midnight news from the BBC when everybody else was tucked up safely in bed and we found out exactly at what time the solitary sentry in our section of the camp, passed out hut. would immediately retune. Some nights we only got headlines, at other times we got the whole lot - but it was a dodgy business and we had to be super careful until, sometime after VE Day we didn't care a damn and put out the BBC on the outside speaker for everyone to hear. We could hear gun fire and bombing getting nearer to the camp, and our guards couldn't do anything about it and we could see them getting more and more jittery. The, our own Commander, Mr Garland, stepped in and told the German Camp Commandant that from there on he, Mr Garland, would be responsible for the safety of the people in the camp. The guards were to patrol as usual and our own appointed police would ensure the safety of those inside. It was a good arrangement because there were quite a number of hotheads who wanted to make a mass break out. This would have been disastrous because in the woods outside there were a lot of groups prepared to make a do or die last stand. around the camp was really beautiful and the snow capped mountains in the distance were certainly worth looking at again and again. 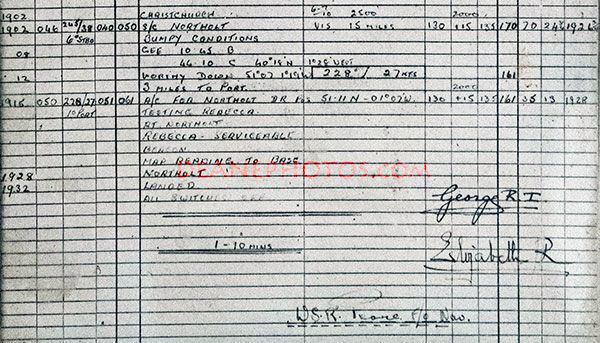 ** the safety of the German guards was guaranteed by Mr Garland - they had been good to us as far as possible and could have made our lives much tougher had they stuck to the rule book. This went on for about a month or so and we thoroughly enjoyed every minute of it. After our month or so of comparative freedom was up, orders came through that we were to be flown back to England. We were taken by lorry to a German airfield near Mindon (I think it was called) and flown to Stanstead in Dakotas, each plane had 60 on board plus all our luggage. Vi and I sat together - we were grossly overloaded and I began to wonder if the pilot would ever get tail wheel off the ground. We seemed to fly for miles just above the treetops before the plane could make any height. I reckon the pilot and I were the only ones who could breath properly after about fifteen minutes of flying - nobody else seemed to worry - they were singing to the top of their voices. I never expected to see Stanstead, but we made it otherwise I wouldn't be here writing ! Billie Towers were living (Eileen had phoned almost everyday to ask when we were coming to stay with them). We really enjoyed Bookham, at that time it was really deep in the country (what it is like now I don't know). It was a mere step to Ascot and of course we made up a party to go - It is my everlasting shame that neither Vi nor I saw much of what went on. Neither of us was strong enough for this kind of life. I still retain vague flashes of deafening noise, flashes of colours going by and horses. In between we just lay down on the grass and slept. It was difficult enough to keep awake to enjoy the picnic lunch Eileen and Billy had brought with them for the four of us. But we did enjoy going to Ascot especially the sleeping part. grow without them being pinched and a few Red Cross parcels in the last few months of the war. We, in the camp, were far better off than those poor folk who were left behind. Thus we came back to Guernsey and the task of getting back to normal had only just begun. © Peter Norris & Mike Deane 2018 -- NO PART OF THE ABOVE TO BE REPRODUCED WITHOUT PERMISSION.